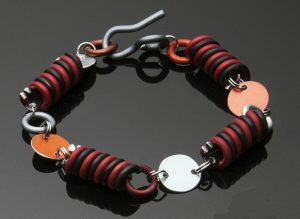 Bracelet fits up to 8″ wrist in 6 colors shown in Capriccio. Bracelet, fits up to 8”. Shown in Sahara (top) & Josephine. 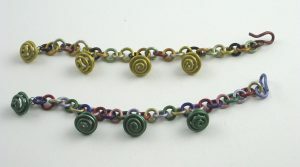 Bracelet with double wire twisted “beads” and hook closure in 6 colors, 8” long, shown in Firenze.